Apple’s September 12 event revealed the Apple Watch Series 4, iPhone XS, and iPhone XR. Together, the devices delivered plenty of big, new features to focus on, whether it’s the larger Apple Watch display and its ability to take an ECG, or the fast new A12 processor and improved camera in the iPhones. But there are always other details waiting to be discovered during these events. They’re either mentioned in passing—blink and you’ll miss it!—or you’ll find them in the spec sheets or press releases. Sometimes those details are just as interesting than the headliner announcements, or even more so for those who watch Apple closely. Here are a few of those little details we’ve uncovered since Apple left the stage on Wednesday. Remember the all-ceramic Apple Watch “Edition” model that started at $1,299? Apple apparently struck it from the lineup. Apple still sells the Series 3, but not the Edition model. Now, all Series 4 Apple Watches have ceramic backs, and the sides and fronts of the cases are either aluminum or stainless steel. Don’t worry, you can still spend over $1,000 on an Apple Watch if you really want to. 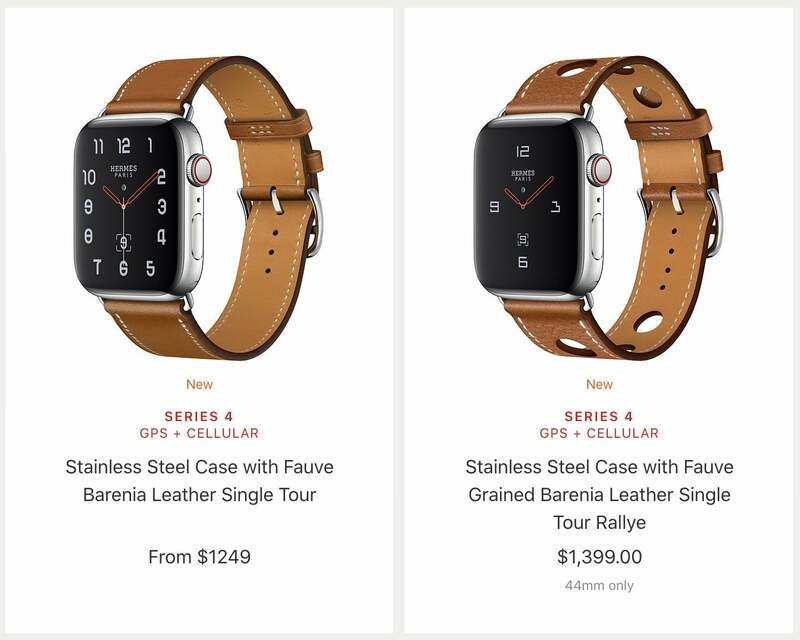 Don’t worry: If you really want to buy an especially pricey Apple Watch instead of paying your mortgage this month, you can get a Hermès model–all of which are stainless steel and come with GPS and cellular connectivity, along with a fancy leather strap and a custom watch face. Those start at $1,299. You’re basically paying about $600 for an admittedly nice leather band and watch face. The iPhone 8, 8 Plus, and X were the first iPhones with wireless charging. They started out supporting a charging rate of only 5 watts, but that got boosted to 7.5 watts with a software update. Their successors may be faster. 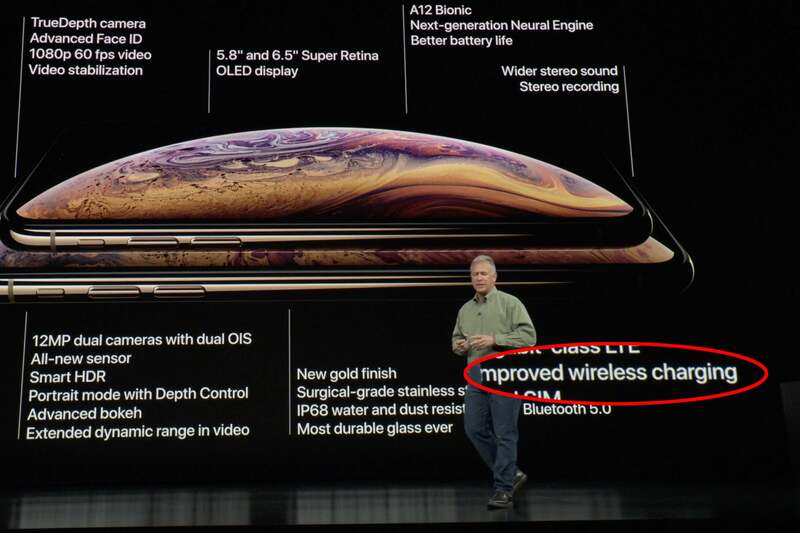 On the final spec updates slide during the presentation, we can spot the words “Improved wireless charging.” Improved how? Is it faster? Does it stay cooler when charging? Is it more reliable with a wider connection area? What’s this? Improved how? We want more details, Apple! Apple probably means that it’s faster, though we don’t yet know how much faster. 10 watts seems to be the current “fast wireless charging” standard, though the Qi spec allows for a potential maximum of 15 watts. With AirPower still a no-show a year after its first announcement, Apple probably just didn’t want to draw any attention to wireless charging. For years, iPhones came in two variants: one that supports CDMA wireless networks (with a Qualcomm modem) and one that does not (with an Intel modem). In line with rumors before the event, it seems that Apple has now moved to a single modem. The modem itself is likely made by Intel (and probably the XMM 7560). Apple iPhone XS specs page lists two seemingly identical models. It’s very confusing. The official Apple specs page still lists two variants: Model A1920 and Model A1921. That’s the iPhone XS and XS Max, respectively, and they support all the same modes and bands. Curiously, the iPhone XR supports all the same technologies and bands as the iPhone XS with one exception: TD-LTE band 46. Weird! In any case, the phones all have far better cellular capabilities than previous iPhones. 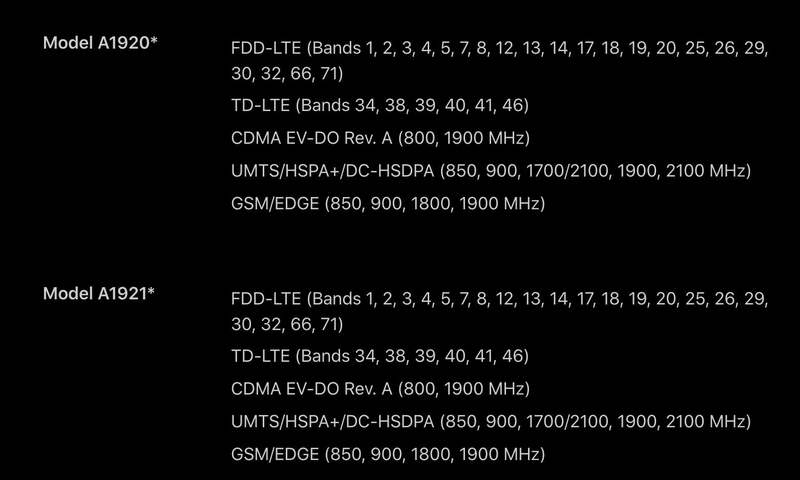 Oh, and you’ll notice that Band 71 is included: That’s the new 600MHz extended-range LTE band T-Mobile acquired last year and has been rapidly building out. This is the first iPhone to support it. 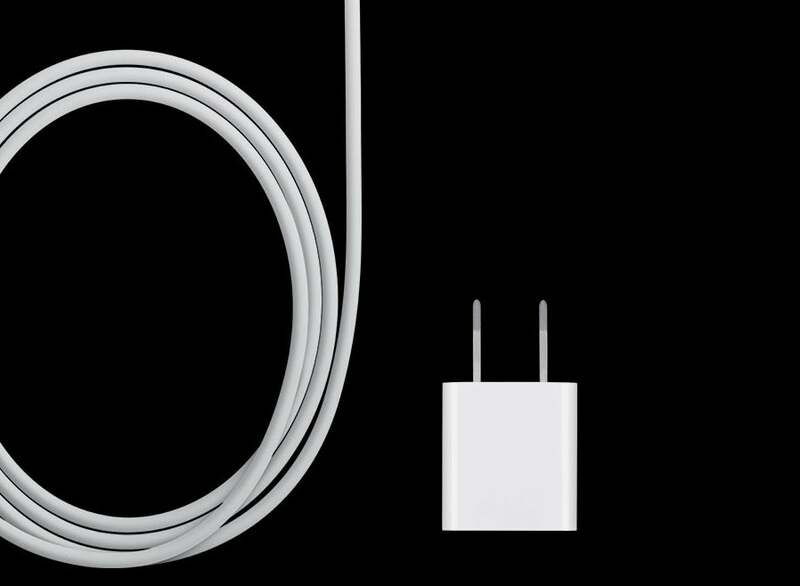 Apple has been shipping iPhones with a little square 5-watt power adapter for ages. Even though the latest phones support USB-C fast charging and charge much more quickly with either a USB-C power adapter or the 12-watt iPad power adapter, and even though other premium phone makers all seem to include fast chargers in the box, Apple is still sticking with the 5-watt charger. This little 5-watt charger just isn’t cutting it anymore, Apple. Including this with a $1,000 phone is a slap in the face. We’ve done the testing, and the charge rate with other chargers is much better. Bundling a 5-watt charger in the box of a $1,000 phone is ridiculous. Apple should do better. While we’re complaining about Apple cheaping-out on accessories for its incredibly expensive phones, allow us to point out that the “In the Box” section of the site is missing one particular items it used to include. Uh, I think you left something out of the box on my super-premium phone, Apple. That’s right, on both the iPhone XS and iPhone XR specs page, the “In the Box” section lists everything you’d expect except the headphone adapter. 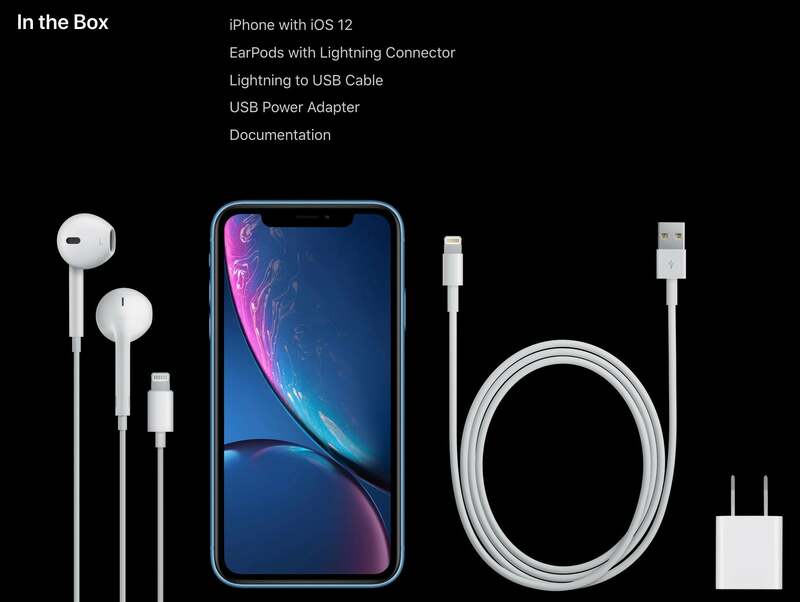 You still get Lightning earbuds, but if you want to use your own headphones, you’ll need to fork over $9 for the Lightning to 3.5mm adapter. Oh, it gets worse! The adapter used to be listed on the iPhone 8 and iPhone 7 product pages, but is gone from those as well. It used to be there, but now it’s not. It would appear that no new iPhones will come with the headphone adapter anymore. Either that, or Apple has conspicuously scrubbed any mention of it even though it’s in the box (which is something they’ve never done before, to our knowledge). That’s true, but it’s also misleading. Series 3–like Series 2 before it–got a little bit thicker than the original Apple Watch. It went from 10.5mm up to 11.4mm. The Series 3 is back down to 10.7mm, so it’s almost (but not quite) down to the thickness of the first Apple Watch. A close look at the spec sheet for the Series 4 shows a few other improvements. Its OLED display still has a maximum brightness of 1,000 nits, but now uses LTPO (Low-Temperature Polycrystalline Oxide) technology. Basically, this reduces power consumption of the display by anywhere from 5 to 15 percent. The Series 4, which has a new W3 wireless chip, also supports Bluetooth 5.0, while the Series 3 with the W2 chip only supports Bluetooth 4.2. Apple is supporting Dual-SIM-Dual-Standby technology in the iPhone XS and iPhone XR by using the usual nano-SIM along with a software-based eSIM. It’s one of those things some users have been hoping Apple would implement for years. In fact, it’s a real selling point for some Android users. 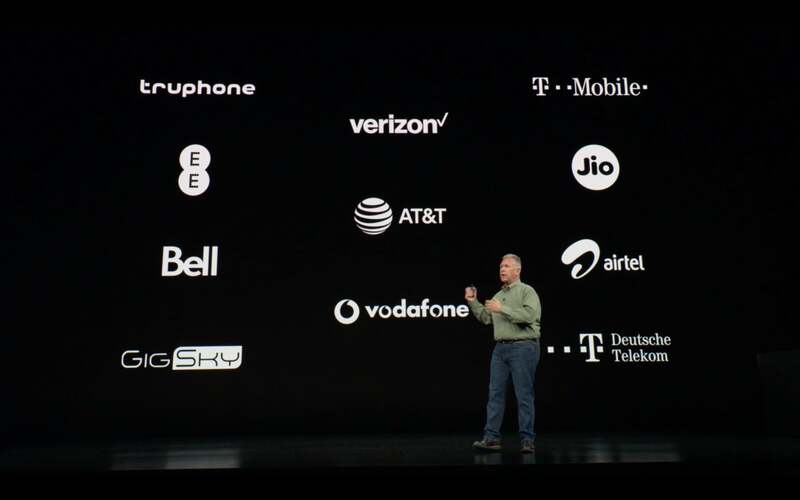 During its presentation, Apple highlighted the carriers that will work with the eSIM technology (which requires specific carrier support). Notice anyone missing? Sprint does not appear to be on the list of carriers supporting Apple’s eSIM technology. Yep, Sprint is not on the list. Maybe it will come around in the coming months, as Apple says it is working with carriers to expand this list. Apple didn’t say as much, but the physical dimensions of the iPhone XS are exactly the same as the iPhone X, and it doesn’t appear that any buttons or logos have moved. That means all existing iPhone X cases should work just fine with the iPhone XS, so there’s no need to go out and buy something that says it’s specifically made for the XS, especially if it costs more. We’ll update this if we hear differently. Naturally, the iPhone XS Max and iPhone XR are sized quite differently, so they’ll both need new cases. Slightly shorter iPhone XS battery life? That’s an hour more video playback time, but an hour less talk time. We’ll just have to wait until we test battery life ourselves, but until then, take Apple’s claim of longer battery life in the iPhone XS with a grain of salt. The iPhone XS Max, with its much larger battery, outlasts them both, according to Apple’s specs.